In a new crime of excessive use of force, on 22 March 2017, Israeli forces killed a Palestinian civilian and seriously wounded a young man after firing artillery shells at them when both civilians were near the border fence with Israel in al-Shokah village, east of Rafah City. The investigations conducted by the Palestinian Center for Human Rights (PCHR) emphasized that the shelling incident violates the principle of necessity and distinction during which the use of force was excessive, especially the victims were only civilians and unarmed. According to PCHR’s investigations and the testimony of an eyewitness, at approximately 00:00, Israeli forces stationed along the border fence off al-Nahdah neighborhood in al-Shokah village, east of Rafah City, fired around 15 artillery shells at 3 Palestinian civilians, who were only 300 meters away from the above-mentioned fence. According to the eyewitness, those civilians intended to sneak into Israel for work. 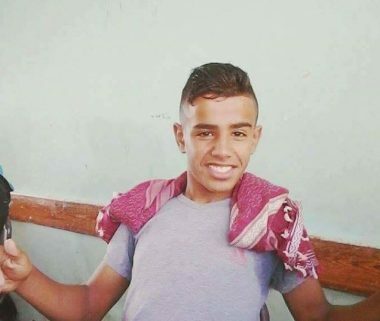 The artillery shells directly hit one of them namely Yousef Sha’ban Abu ‘Athra (16), from al-Shabourah refugee camp in Rafah City, to the upper part of his body. Meanwhile, Mohammed Wahid ‘Atallah al-‘Akar (25), from Yibna refugee camp in Rafah, sustained shrapnel wounds to the chest and abdomen. The child died on the spot while al-‘Akar was transferred to the European Hospital in Khan Younis due to his serious wounds. The Palestinian Red Crescent Society (PRCS) said to PCHR’s fieldworker that the Palestinian Liaison told the PRCS they received information from the Israeli Liaison there is a dead body in the aforementioned area. The PRCS immediately headed to the scene to find the child’s dead body 300 meters away from the fence while they found al-‘Akar lying around 500 meters away from the fence. It should be mentioned that since the beginning of 2017, the Israeli forces have killed a Palestinian civilian and wounded 21 others, including 3 children. PCHR strongly condemns this crime, which further proves the continued use of excessive force by Israeli forces against Palestinian civilians in disregard for their lives. Therefore, PCHR calls upon the international community to take immediate and effective action and reiterates its call for the High Contracting Parties to the 1949 Fourth Geneva Convention to fulfill their obligations under Article 1; i.e., to respect and to ensure respect for the Convention in all circumstances, and their obligation under Article 146 to prosecute persons alleged to commit grave breaches of the Fourth Geneva Convention. These grave breaches constitute war crimes under Article 147 of the same Convention and Protocol (I) Additional to the Geneva Conventions to guarantee the right to protection for Palestinians civilians in the occupied Palestinian territory (oPt).